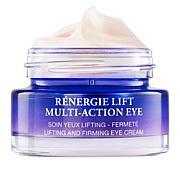 This instant cooling eye cream moisturizes and primes the eye area before makeup application. Gently squeeze the tube to dispense a small amount of product and apply around the eyes, avoiding the upper eyelid area. Ingredients: "AQUA/WATER/EAU, CAPRYLIC/CAPRIC TRIGLYCERIDE, TRIHEPTANOIN, SUCROSE STEARATE, GLYCERIN, SIMMONDSIA CHINENSIS (JOJOBA) SEED OIL, BETAINE, ACACIA DECURRENS/JOJOBA/SUNFLOWER SEED WAX POLYGLYCERYL-3 ESTERS, BUTYROSPERMUM PARKII (SHEA) BUTTER, HYDROGENATED C12-18 TRIGLYCERIDES, GLYCERYL STEARATE CITRATE, DICAPRYLYL ETHER, DISTARCH PHOSPHATE, SUCROSE, SUCROSE DISTEARATE, ADANSONIA DIGITATA (BAOBAB) PULP EXTRACT, ALANINE, AMMONIUM ACRYLOYLDIMETHYLTAURATE/VP COPOLYMER, ARGININE, BENZYL ALCOHOL, BRASSICA CAMPESTRIS (RAPESEED) STEROLS, DIAZOLIDINYL UREA, ETHYLHEXYLGLYCERIN, GLYCERYL CAPRYLATE, GLYCINE SOJA (SOYBEAN) OIL, HYDROLYZED MYRTUS COMMUNIS LEAF EXTRACT, LONICERA CAPRIFOLIUM (HONEYSUCKLE) FLOWER EXTRACT, LONICERA JAPONICA (HONEYSUCKLE) FLOWER EXTRACT, MENTHYL LACTATE, MOURERA FLUVIATILIS EXTRACT, PARFUM/FRAGRANCE, PCA, POTASSIUM SORBATE, PYRUS MALUS (APPLE) SEED EXTRACT, RHODIOLA ROSEA ROOT EXTRACT, ROSMARINUS OFFICINALIS (ROSEMARY) LEAF EXTRACT, SACCHAROMYCES CEREVISIAE EXTRACT, SALICYLIC ACID, SERINE, SODIUM BENZOATE, SODIUM GLUCEPTATE, SODIUM HYALURONATE, SODIUM PHOSPHATE, SODIUM STEAROYL GLUTAMATE, SUNFLOWER SEED OIL SORBITOL ESTERS, THREONINE, TOCOPHEROL, TOCOPHERYL ACETATE, XANTHAN GUM, YOGURT POWDER. This is a first for me. Love how the skin around my eyes feel. Yes, you cant squeeze while opening (that could be fashioned differently but once you get the hang of it its not a problem. This is the first time I have used this product. I have used Korres for several years and can't find anything better out there . When I put this on it felt cooling but also seemed to soak right in but left my skin feeling wonderful. I bought this when it was first introduced and having been using for about six weeks. It's a very good cream and when I use it at night I wake up with beautiful soft skin. I can see less bagginess. I will definitely buy it again. For me, this product is fantastic. So many eye products just don't seem to work for me. 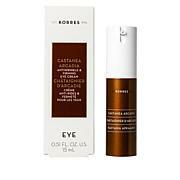 This one soothes dryness and calms my eye area. Pronounced wrinkles and bags when I smile greatly reduced. That for me is the biggest benefit. Used during Hurricane Irma recovery and is helping me feel great considering. 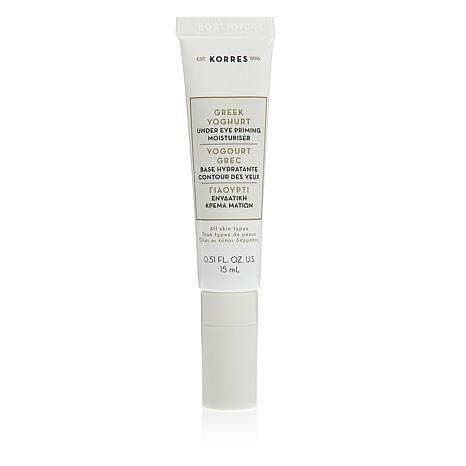 First Korres product I actually love. Thank you! The eye cream is very nice and hydrating, but the packaging needs improvement ...in my opinion. Difficult to remove top in order to use the special delivery.